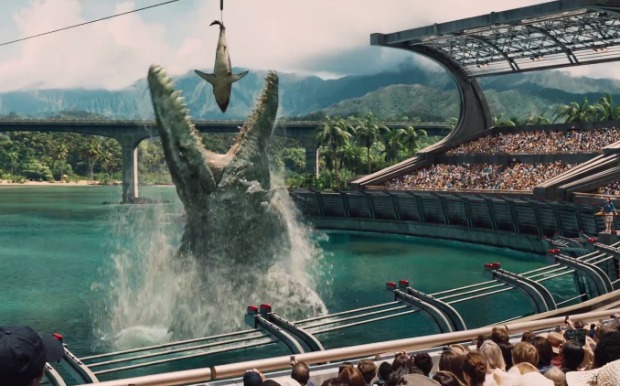 Guest poster Brent Harris steps inside the gates of Jurassic World to bring a non-spoiler review. Much of the movie’s chaos is comfortably held behind goliath gates for the first two acts of the film while it takes its time to wonderfully develop its tone and themes. There are quite a few touching homages to the original Jurassic Park, and where World is fully aware of itself and pays respects to Park, the movie is truly at its best. The third act was clearly written by an eight-year-old playing with a bucket of plastic dinosaurs. Jurassic World continues the theme of control which Jurassic Park author Michael Crichton so deftly crafted in his original tale. Are we ever really in control? Or, as this movie asks, are we the ones just used to being the monsters? Here, the committee of story-tellers give us the uptight control freak, Claire Dearing, played by Bryce Dallas Howard, as the Hammond-clone who has successfully managed Jurassic World for an unspecified number of years since the incidences which shut-down the first Jurassic Park. That’s when this amusing ride breaks down. The film takes a tour of themes involving sexism, rights of cloned animals, the possibilities and dangers of genetic modifications and then makes a bizarre detour toward a burdensome plotline involving the sinister use of dinosaurs for military purposes. “Makes you wonder what else Ingen was up to,” Grant pontificates in the third film of the series. These themes are certainly fine to explore, but the film only ever scratches at the surface without sinking its teeth into any one of them, only to abandon all pretext of any story by the time dinos rampage across the screen in the final act. 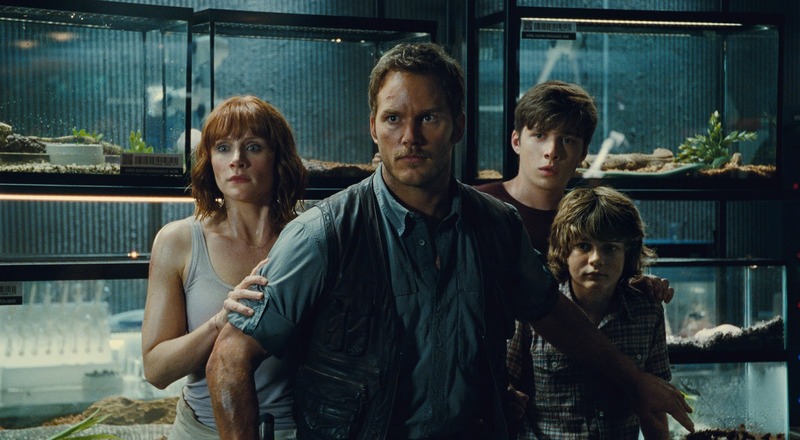 Jurassic World strives to do too much, without ever doing any one thing well. For Story, I give it: 3 Ian Malcoms out of 5. Brent Harris is a dinosaur enthusiast, a writer and is known to lie around like a shirtless, injured, Ian Malcolm. One of his first short stories, a Fanfic of Jurassic Park, involved a heavy portion of the plot to Jurassic World, written twenty years ago. He wonders when his royalty check will be posted. When you get that royalty check, pass it around. Great review. Does not make me want to see the movie though. 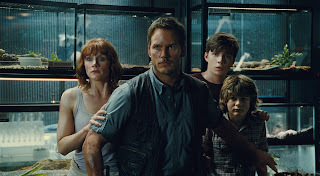 As a big fan of Jurassic Park (the novel, not so much the films), I always go to these screen portrayals with a mix of deja vu amusement (as my nightmares are filled with dinosaurs chasing me in Disneworld) and wonder on how much of the actual scientific ethic debate (which was part of the book plot) will be skipped in favour of the next stunning cgi sequence. That said, I settle for the unbridled fun that is watching people running away from dinosaurs that put Lassie to shame because some mad scientist thought they would be great pets. Also, a pack of raptors running alongside Starlord in a dirt bike? It is the closest thing we will get to a Dinoriders show. Now I demand that for the sequel they add lasers and telepathic headbands. C'mon Ingen, you can always aim higher and fail epicly as expected, you are the Homer Simpson of evil corporations.